The Le Mans Series prides itself on visiting the classic tracks of Europe and, in the case of Monza, never was a truer statement made. 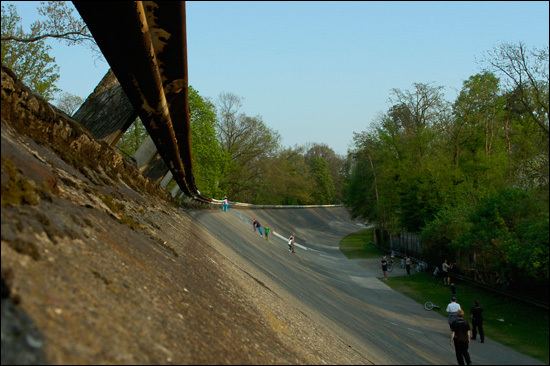 But the Grand Prix circuit is only part of that story: lurking deep in the royal park is another part of Monza folklore, the extraordinary banked circuit that was last used back in 1969. It’s a difficult sight to explain to anyone who hasn’t seen it. For British visitors the closest parallel is the banked Brooklands circuit, which was hacked to pieces rather than preserved, and whilst the flavour of the old circuit remains (with some surviving chunks of banking) the circuit as a whole is a fading memory. Monza though is a completely different kettle of fish and in the trees of the royal Parco di Monza lurks a simply incredible sight. It draws motorsport enthusiasts like moths to a flame and there is nobody more enthusiastic than a racing driver with a sense of history. 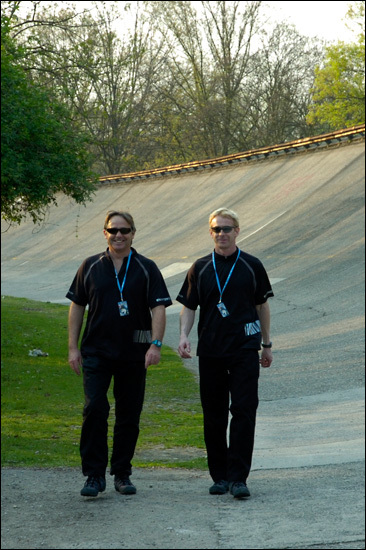 It therefore took absolutely no powers of persuasion whatsoever to encourage Embassy Racing’s dynamic duo Warren Hughes and Neil Cunningham, while at the circuit for the opening LMS event, to join the dsc boys on a walk in the woods to see Europe’s last remaining monument to the early years of motorsport. Walking up the inside of the front straight you soon reach the Prima Variante, the first chicane. Walk along the line of the fence on the outside and you soon find yourself in a motorsport landscape generations away from the gravel traps and chicanery (literally and metaphorically) of the 21st century scene. “There are a lot of ghosts here,” says Neil Cunningham as he looks at the incredible sight of a totally complete banked turn (the northern banking) disappearing into the distance as it curves around to the right. He’s not wrong either, Campari, Borzacchini and Czaykowski all lost their lives here (albeit on the opposite (South) curve in 1933. Wolfgang von Trips too lost his life close by in the 1961 Grand Prix (together with ten spectators), an accident that brought down the curtain on Formula One cars using the banked circuit. The scale and condition of the track is astonishing and despite some patching and some exposed reinforcing rods showing through the gently crumbling original concrete, this is a remarkably complete monument to motorsport from a bygone era. Both of the Embassy boys went almost instantly from chatty and engaged to quiet and thoughtful. This is a place where time has stood still and there is atmosphere that can almost be tasted. “It really is amazing isn’t it?” says Warren Hughes, but you can almost see the racing driver in him emerging again, working out how yesterday’s heroes found the fastest way around what must have been a daunting circuit. Racing didn’t stop here in 1961 though, sportscars continued until the end of that decade. The final major sportscar race to use the banking was the 1969 1000 Kms. That race was won by Jo Siffert & Brian Redman in a Porsche 908 at an average speed of 206.342 Kph. Compare that with this year’s winning Peugeot 908 Hdi FAP which covered the same distance at an average speed of 200.876 kph – progress eh! The 4.5 km banked oval was completed in 1922 and formed part of a complex including a 5.5 kilometre road course, which is largely the basis for the circuit still in use. Both circuits were used in combined format for major races (including Grands Prix) leading to the odd concept of cars passing the start finish straight twice on the same lap. Now though the banking has been claimed by sightseeing race fans and daredevil picnickers, with adults and children alike unable to resist the magnetic attraction of the very top of the banking. Steep? I should say so. It takes commitment to get to the top, so pronounced is the angle of the banking, and once you do reach the top it takes strong arms to hang on. Let go and a nasty tumble is almost inevitable. Rockingham and Daytona eat your hearts out, this ladies and gentlemen is the real deal. The brave run all the way down, the stupid try to slow themselves too quickly and end up regretting it instantly and the rest (including yours truly and Warren Hughes) take the option of a low shuffle which trades off dignity for added safety. Safety isn’t something that came naturally when this place was in its heyday! To have modern sportscars racing here would be unimaginable, the margin for error is minute, the consequences enormous. Conversation turned to the future of this extraordinary relic, with opinions divided between returning part of it to some form of motorsport related use through to allowing it to return gently to nature in the middle of the only royal park in the world that reverberates to the sound of racing engines. 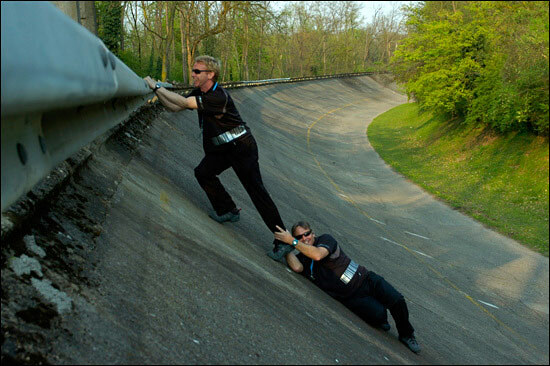 The astonishing thing about the Monza banking though is that even when the cars aren’t lapping on the modern circuit – if you close your eyes you can still hear the scream of racing engines.